A perennial herb that can be harvested in the first year. Plant in permanent spot in herb garden. Can also be grown in planters or pots. 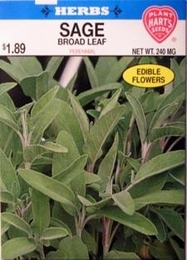 Sage is widely used as poultry seasoning, in sausage, soups and stews. Sage leaves can be cut anytime for fresh use. For winter use, cut entire plant and hang upside down to dry. Then remove leaves and pack in jars. Planting time - Early spring to mid-summer for harvest in late fall.